Wishing all of you a very Happy Ram Navami! This Saturday start your day with something sweet! Something that has a great significance this day and is prepared in almost all North Indian homes. 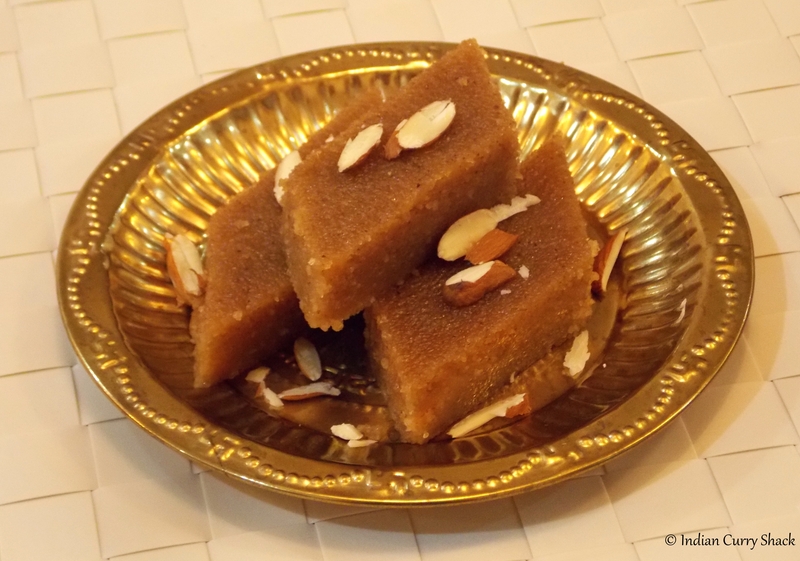 It is Sooji Ka Halwa (Rawa/Semolina Halwa). 🙂 It is completed by two other delectable dishes on this day which are Ghugni (Kale Chane/Black Chickpeas preparation) and Poori (Indian Wheat Bread which is deep fried). In a pan/cooking vessel, heat water with crushed cardamom seeds and sugar (for about 5 minutes or till the sugar completely dissolves). Keep aside. 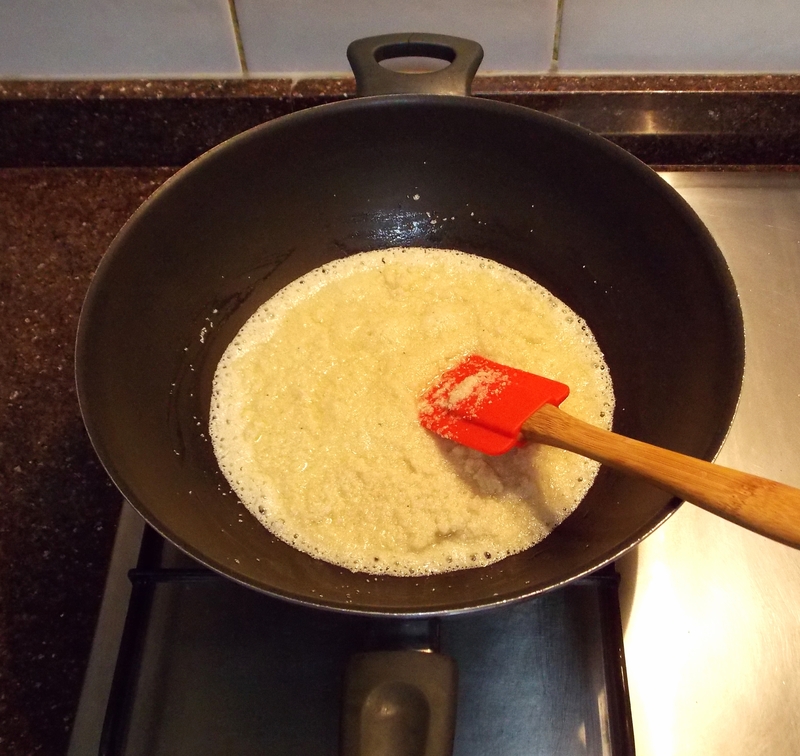 In a large pan, add semolina (sooji/rawa) and ghee (clarified butter). Stir continuously on medium flame till the semolina (sooji/rawa) is golden (ensure that it’s not too dark, as it might start burning after that). Now switch OFF the flame. Add the hot water and sugar solution (be careful while pouring the solution as the hot water might splash). Switch ON the flame and keep stirring continuously on high flame till the water and semolina (sooji/rawa) are well combined. Keep stirring. You will see the mixture leaving the sides of the pan and ghee (clarified butter) being released from the sides of the mixture. Switch OFF the flame and add half the sliced almonds and mix well. While serving garnish the Halwa with the remaining sliced almonds. You can either serve the Sooji Ka Halwa hot or cold. When serving hot, you can serve in a bowl/plate by garnishing with sliced almonds. 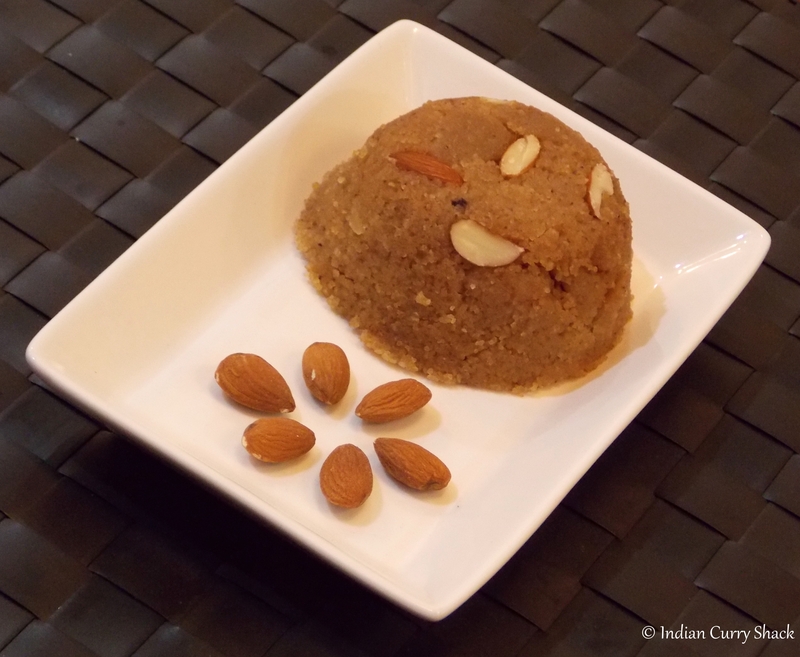 When serving cold, you can slice the Halwa into a shape of your choice and serve garnished with almonds. 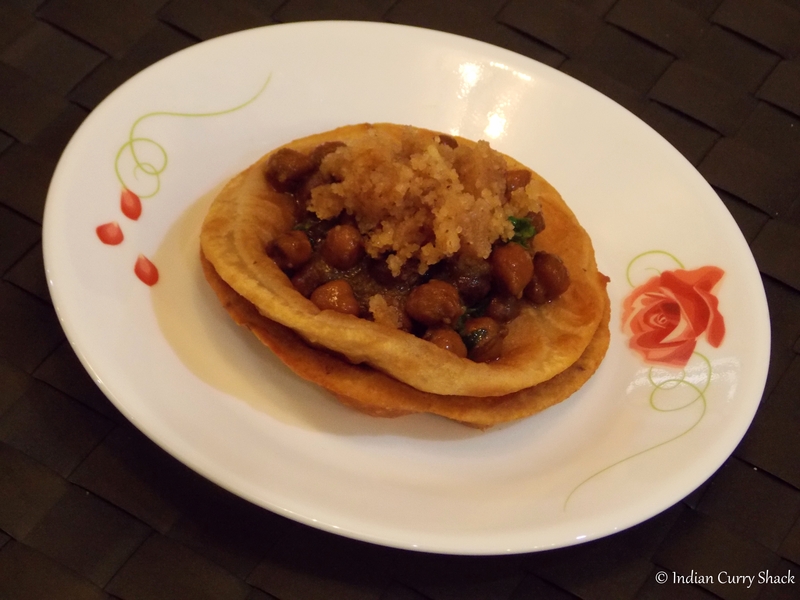 You can also enjoy it with Ghugni (black chickpeas preparation) and Poori (Indian wheat-bread which is deep fried). It is a fantastic combination. Your tasty Sooji Ka Halwa is ready to relish! My favorite 😃 I miss home after seeing this! The toasted semolina looks and sounds delicious! tempting – so many sweets on Indian blogs – wasn’t it just Holi and then there was Diwali – and now Ram Navami – and every recipe for each of these holidays is more tempting than the last – lucky I can just admire from afar!